Above you see the final AR user interface concept for the trainer (icebreaker). This is all compressed down to one screen for demonstration purposes. 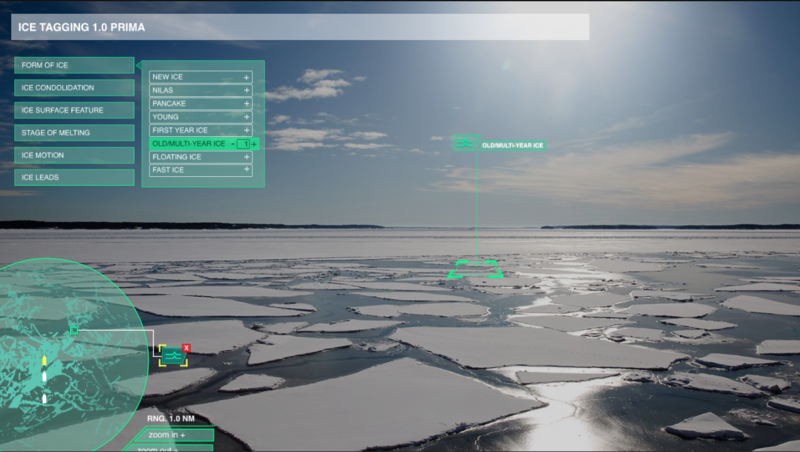 To the top left is the selection of the different ice-tags the trainor can choose between, these are based on the ice categorizations from “The Nautical Institute, Ice Navigator Accreditation Standard”. The tag in the center includes the ice-type and the ice-symbol. The area of interest is in perspective, so the students (convoy) know what area they are looking at. The circle in the bottom left corner is the mini-map which show the landscape. The mini-map has a radius of 1 nautical mile, which is standard for a normal radar, but the trainer can choose to zoom in and out. The data in this mini-map is based on the latest generation ice-radar, which can show the ice more clearly then a normal radar. 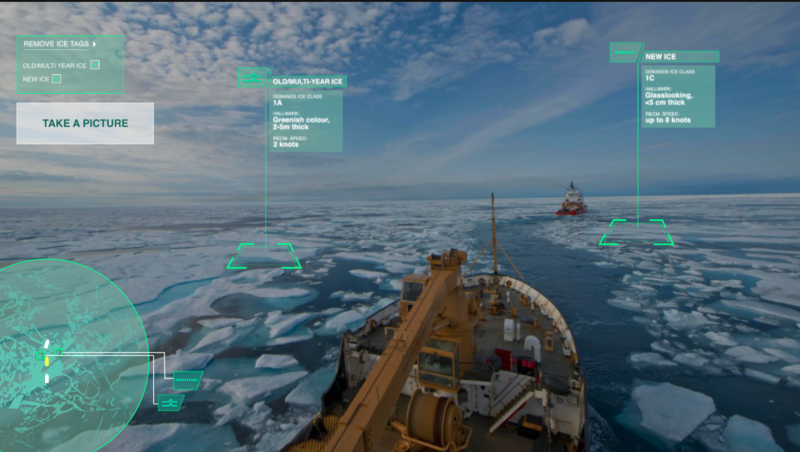 Within the ice-radar, the user sees the ships in the convoy, and the users ship is marked as yellow. The little square in the minimap is a representation of the ice-tag in the environment, and is possible to move around. 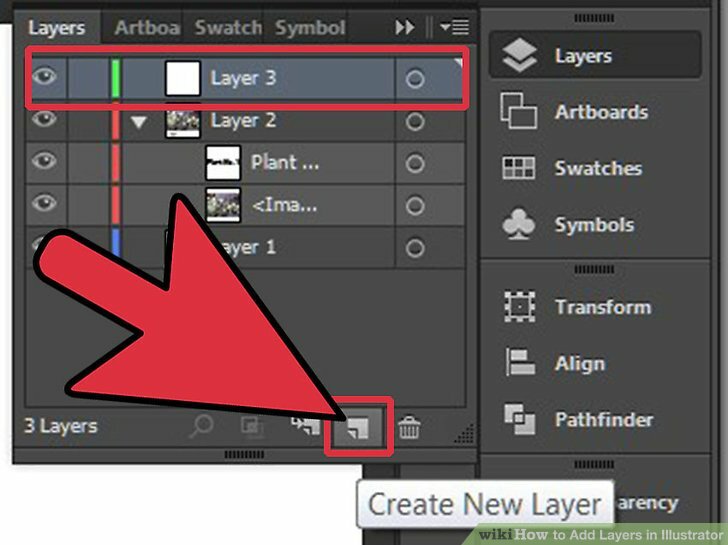 The component pointing out from the square, is the ice-symbol which the user can choose to delete, or scale up and down. It is placed on the outside so the user know which tag is which, for instance if the user where to place may ice-tags. This was quite a tricky part, because the little square in the minimap doesn’t provide the user with much information except where the tag is placed. Therefore there was need to place it outside the mini-map with the ice-symbol. But what if there is multiple ice-tags, how will these components outside the mini-map be ordered? The students in the convoy, has many of the same components in their UI. But in the ice-tag, they’ll be presented with more information within each ice-tag. They can also choose to take a “screengrab” so they can look at that later when there is downtime on the ship. This is a different tool I haven’t decided to design this round. Additionally as the student get better at the different ice-type, they can choose to deselect the tagged ice (top left) if they feel they don’t have to see it.